This essential, enlightening, truly delightful collection shows one of our greatest writers parsing the political, artistic, and media landscape of the past three decades. These sixty-six essays and reviews, culled from the pages of The New York Review of Books, The New York Times, Harper’s, The Atlantic, and The New Yorker, among others, find Lorrie Moore turning her discerning eye on everything from Philip Roth to Margaret Atwood, from race in America to the shocking state of the GOP, from celebrity culture to the wilds of television, from Stephen Sondheim to Barack Obama. See What Can Be Done is a perfect blend of craft, brains, and a knowing, singular take on life, liberty, and the pursuit of (some kind of) happiness. 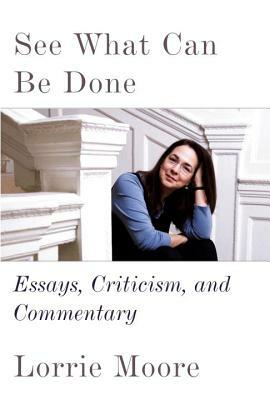 LORRIE MOORE is the Gertrude Conaway Vanderbilt Professor of English at Vanderbilt University. She is the recipient of the Irish Times International Prize for Literature, a Lannan Foundation fellowship, as well as the PEN/Malamud Award and the Rea Award for her achievement in the short story. She is a member of the American Academy of Arts and Letters. She lives in Nashville, Tennessee. "From one of America's most brilliant writers ... a delight ..."
"Incisive, wide-ranging ... marvelously nuanced ... Moore is a lively guest at the party, but she never tries to steal the show." "A testament to the breadth of Moore's intellect. There are pieces here on everyone from Nora Ephron to Kurt Vonnegut to Edna St. Vincent Millay, and everything from Christmas pop songs to 9/11. What unifies these pieces--what must galvanize any such collection--is the author's voice, a prevailing sensibility. 'One must throw all that one is into language,' she writes, 'like a Christmas tree hurled into a pool.' At its best, See What Can Be Done is not only a call to that ideal, but a fulfillment of it." "34 years of lively, often humorous critical prose. Moore's wicked wit is demonstrated by the opening sentence ... What sustain overall this group of essays and commentary is a continuous critical spirit that stays in touch with life." "Intimate and approachable ... See What Can Be Done flooded my veins with pleasure. Had she wanted, Moore could have had an important career as a theater or television critic. When writing teachers pass this book to their students, the title will be read as a simple command." "Lorrie Moore's writing and analysis, as with her fiction, is so consistently smart, funny, and unexpected that the essays end up feeling far more compulsively readable than it seems essays have any right to be. It's like she's invented some sort of extremely healthy snack that possesses all the addictive qualities of junk food. It's not only an extremely good-looking book, it's also an extremely good book, period." "Fascinating insights into one of America's finest short story writers and her ever-evolving understanding of her craft ... her incisive readings are a must for budding authors ... this rewarding collection from a wonder of American letters provides a rich reading list, while Moore, cogent, distinctive, and entertaining, reiterates what great art can do." "This collection of 60 lucid and erudite cultural essays by the award-winning fiction writer is a treasure." "Deft, graceful essays from a sharply incisive writer." "A fantastic collection ... The essay on writing alone is worth the price of admission. If Lorrie Moore is not the Miles Davis of cultural criticism, she is surely the Bill Evans; she's got those brilliant harmonies and that swinging incisive wit." "Acclaimed fiction writer Moore has compiled her nonfiction writings into a marvelous collection ... a window onto the trajectory of both late 20th-century American culture and Moore's development as a writer. Throughout, her chief virtue as a critic is shown to be a sympathetic, generous eye ... a boon to any lover of smart cultural criticism."